This pattern was designed to be part of the Sweet Potato 3 Patterns Cancer Charity Challenge 2015. 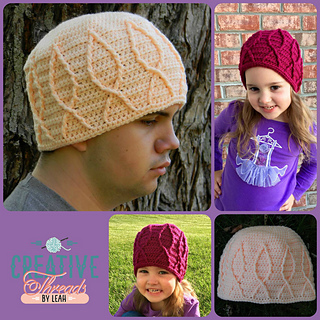 I designed this pattern to fit a bit large so it is not snug on a cancer patient’s head. My mom couldn’t stand to have anything that was overly snug on her head no matter how soft it was when she was undergoing treatment. Cabled ribbons around the circumference of the hat can be made in a solid color or done in colorwork to really make the ribbons pop.